We’re all about empowering our people. To solve big problems, to drive results — and to be who they are. Over the years, we’ve made giant leaps to make our environment a place where everyone feels comfortable. We believe diversity and inclusion is more than just a box you check; it’s ingrained in the way we work. And we’re always looking for ways to make it even better. 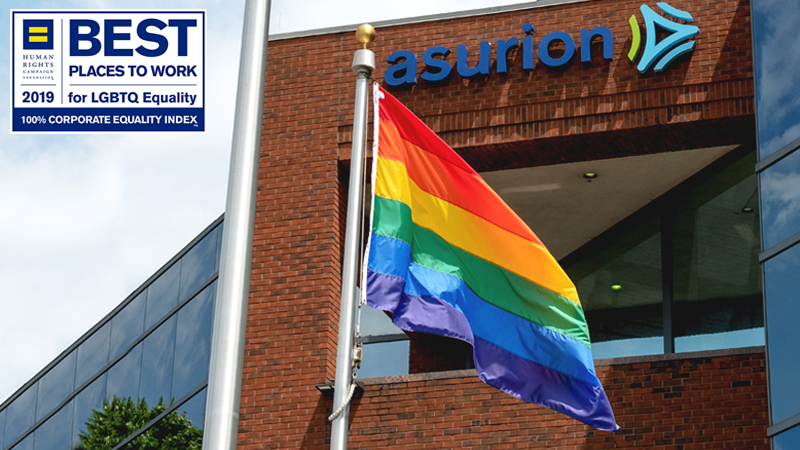 In 2019, Asurion earned a perfect score on the Human Rights Campaign Foundation’s (HRC) Corporate Equality Index. HRC uses this benchmarking tool to examine corporate policies and practices supporting lesbian, gay, bisexual, transgender and queer employees. Those who earn top scores also earn the distinction of being named a Best Place to Work for LGBTQ Equality, a title we wear with pride. Asurion is one of more than 560 companies across the U.S. who received a top score. Only one other Nashville-based company and three other Tennessee-based companies were named among the best places to work for those in the LGBTQ community. How did we earn 100%? To put it simply — diversity and inclusion is important to us. Top level leaders don’t just talk about it, they believe in it. They jumped at the opportunity to knock down barriers and create a welcoming environment, working in partnership with our PRIDE employee resource group. “We’re committed to fostering a culture where all people and perspectives are valued, and our employees can bring their whole selves to work,” said Nikki Smith-Bartley, Asurion’s Vice President and General Counsel for Diversity and Inclusion. Whether you work at Asurion or you live in one of our communities around the world —we truly care about you, and what you bring to the table. “We’re giving people the confidence to believe that who they are is okay,” said Kimberly. Or culture is one of the reasons 88% of our employees said Asurion is a Great Place to Work®. We know there’s still work to do, and we have no plans of stopping improvements any time soon.